It is really difficult for the branch of an original to hit the same mark. While there are many good examples in recent times of how to get it right (or very close) with the likes of Messina, Belle’s Hot Chicken, and Fonda for a few, it becomes more difficult where the process is especially skilled. HuTong presents an intriguing case, because the original is exceptional, and because the art of imitation seems more difficult in relation to dumplings than other less exacting dishes. The bonus for the Prahran branch of HuTong is not needing to drive into the city, relatively easy (and free) parking along Commercial Road, and a larger restaurant meaning there’s no need to wait for a table. Casting my eye around the ground floor Cullen Hotel lodgings of HuTong Prahran it appears this venue is at least twice as large as the one on Market Lane in the City. There is a large range of dishes available, and specific inclusion of “Peking Duck” in the name, but we are here to compare the dumplings. 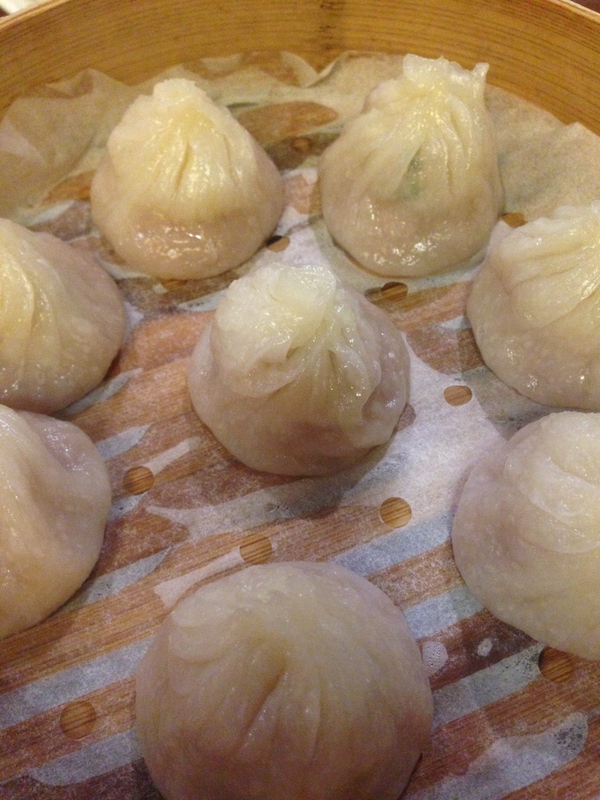 We order some of the usual suspects such as shao long bao (soup dumplings), pan fried pork dumplings, the prawn/scallop/pork dumplings, and in addition we try the Peking duck dumplings. It is difficult to put my finger on it, and it could be purely being in a different location, but the shao long bao wrapper is just that touch firmer in this serve. The soup and pork filling is still wonderful. 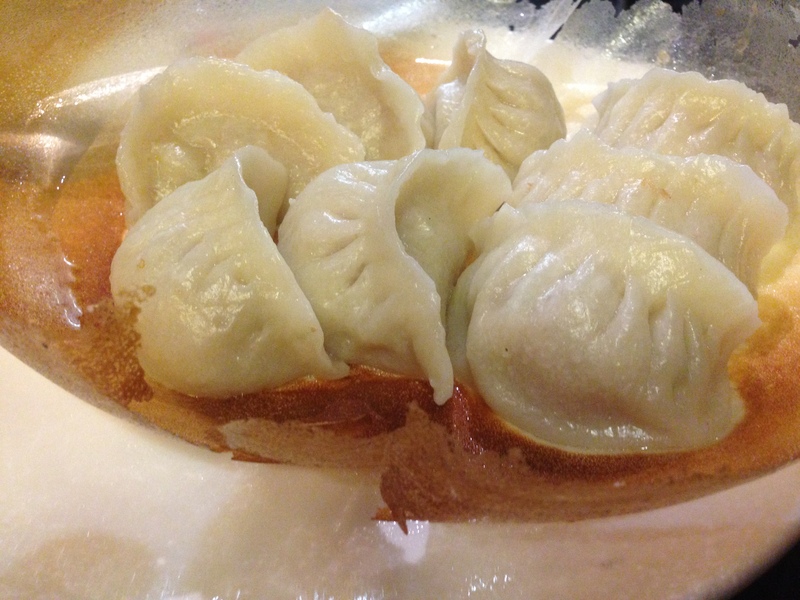 The pan fried pork dumplings are served in their usual HuTong way, connected by the pancake like base that has lightly covered the pan. It is novel, but I also like the crunch. In saying that, the dumplings themselves could have been fried for that bit longer, as some are still a touch soft. The combination dumplings of prawn, scallop and pork are generously filled with excellent quality base ingredients, and the dumpling wrapper in this case is perfect. However, the Peking duck dumplings are too glutinous, providing an unsatisfying mouthfeel, and the duck itself is not as juicy and gamey as you would expect. Catherine doesn’t even bother with her second one, but I give mine another go and it is slightly better, but we would not order this dish again. The Thursday night crowd has now pretty much filled HuTong with a combination of couples, small and large groups. We notice that many tables are ordering from the main menu and leaving aside the dumplings which would be sacrilege at the original restaurant. The crowd alone is a good indication that the locals are appreciating having this city institution available closer to home. While there is a tightrope to walk when expanding a brand known for its skill and quality, I think HuTong has done a good job with its foray into Prahran. The relative ease of dining here as opposed to the city makes it a real option for everyday dining, but it is unlikely to ever have the same place in my heart that its city sister does. Cheap and cheerful is often used as a description for somewhere that just actually is not very good. It has become a clique rather than maintaining what it should mean, which is a place that is informal, friendly, and doesn’t break the bank. 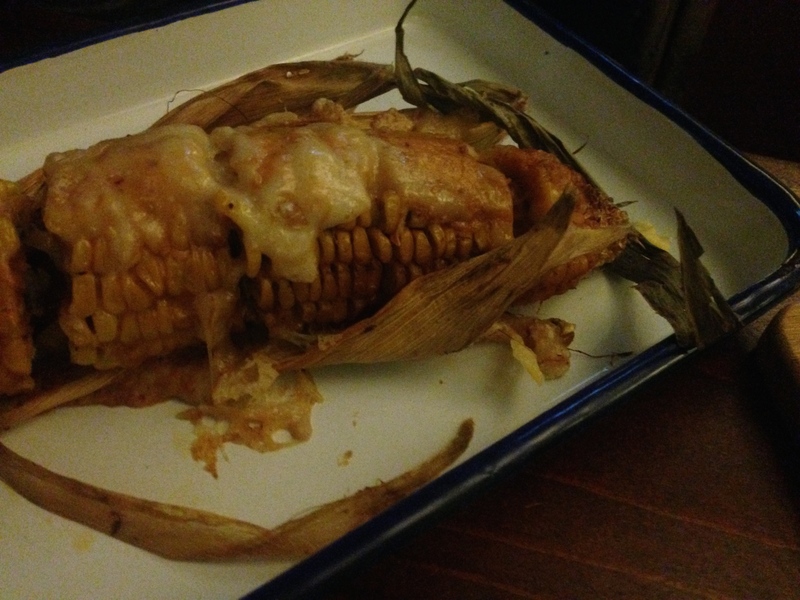 To be transparent, I was not planning on writing a blog on South Yarra Trattoria. My friend had organised dinner for a group, and this was a safe option from her significant South Yarra experience, describing the restaurant as “cheap and cheerful”. Organising a group dinner is always a challenge, and luckily tonight was properly cheap and cheerful. 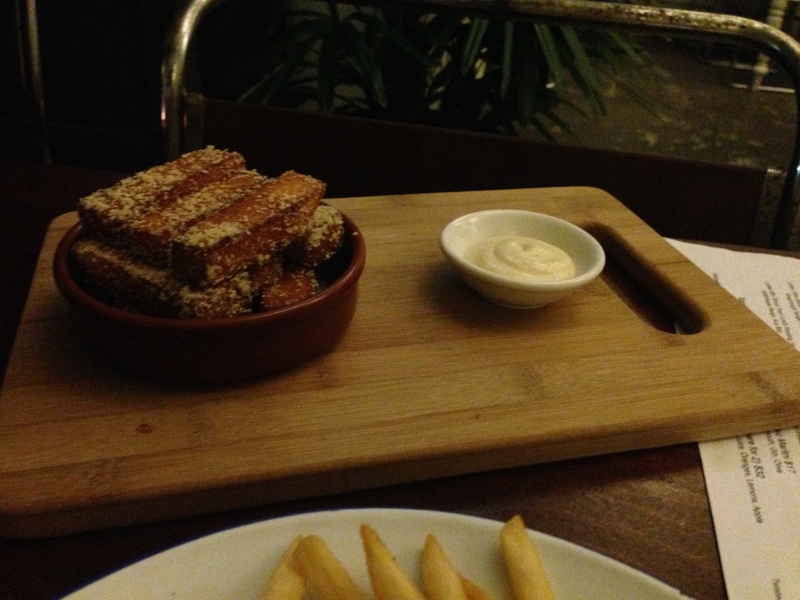 The reason I decided to do a short review is that South Yarra Trattoria is worth knowing about. The menu is a novel of everything fitting into the description of informal Italian with the exception of pizza. Within each grouping of pasta, veal, gnocchi and other staples there is around six or more options. Mathematicians would have difficulty in coming up with the number of possible combinations for entrée, main and dessert. Seated at a large table at the back of the restaurant was genius by the floorstaff as we long outstayed our welcome, even for a Saturday night. BYO wine will do that to you. But the staff didn’t do any packing up immediately around us, making all aspects of the service experience great. In fact, the tempo, and attentiveness of our waitperson was excellent. The food is incredibly well priced, but given the pricing you get the formula you would expect. It is tasty food, but there is nothing surprising, with ingredients that the average shopper would be using from a supermarket chain. Our entrée calamari was lightly cooked, but still had some toughness to it, suggesting either lack of quality, or lack of tenderising. On the flip side, my gnocchi Calabrese was delicious with a sauce not holding back on chilli spice, and a serve not holding back at all. 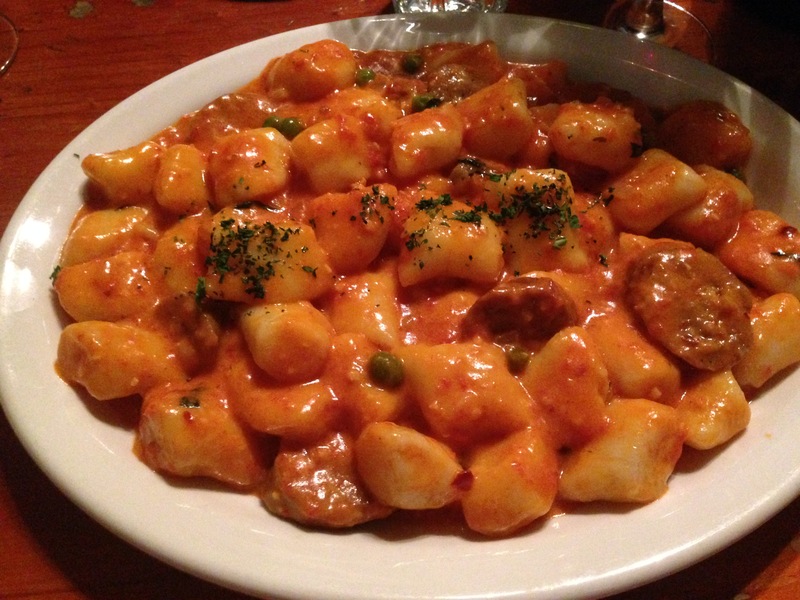 The gnocchi in this case is a nice quality and comparable to more expensive versions. Catherine’s lasagne was decent, without that higher level of love that you can taste when execution is more fluent, and ingredients are higher in quality. The desserts were the same. 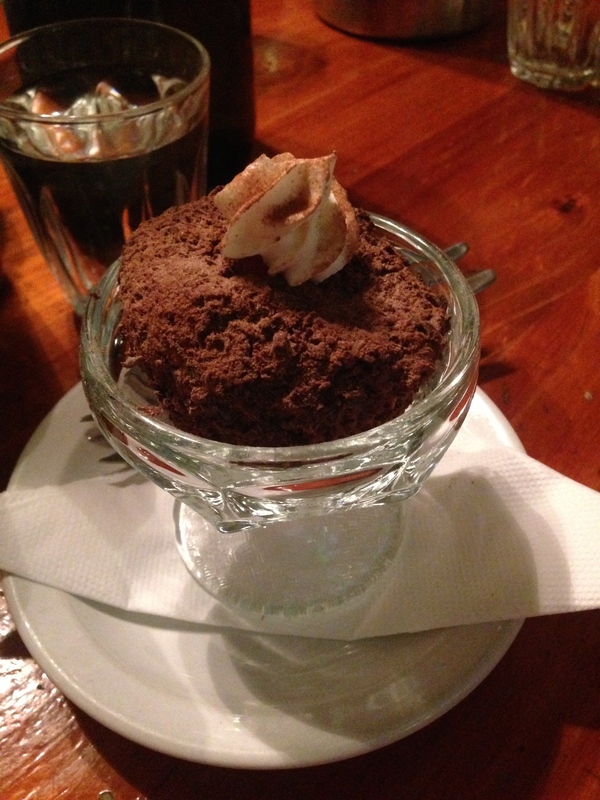 Tried and true sweet treats, like our tartufo (Italian ice cream dessert, rolled in chocolate in this case), tasted nice, and for $8 that is a very reasonable dessert. But this place isn’t purely just about food, it is about sharing a meal with friends, in an environment made particularly convivial by the waitstaff. There are ways to do cheap well, and a completely full restaurant here, in an area with some Italian powerhouses (Da Noi, E’Cucina, 38 Chairs) shows that South Yarra Trattoria is doing a good job. Geelong and gourmet are not often used in the same breath. Sure, if you walk down the average street and try to find a great coffee and breakfast you might be disappointed. But a bit of research goes a long way. The night before we were wandering around on a quiet Wednesday and spotted Freckleduck during our travels. With some confirmatory Google searches we gave it a try the very next morning. It is casually fitted out with comfortable furnishings; old light wooden tables in particular, with the stripped back brick wall providing a bit of pizzazz. The staff are friendly and there is a nice feel. There are several dishes on the menu that sound excellent, but after eight courses the night before at Gladioli we are keen for some simple bacon and eggs. Simple bacon is not available, so we go for the maple bacon and it is as decadent as it sounds, but still fatty enough to soak up some of the matching wines from last night! 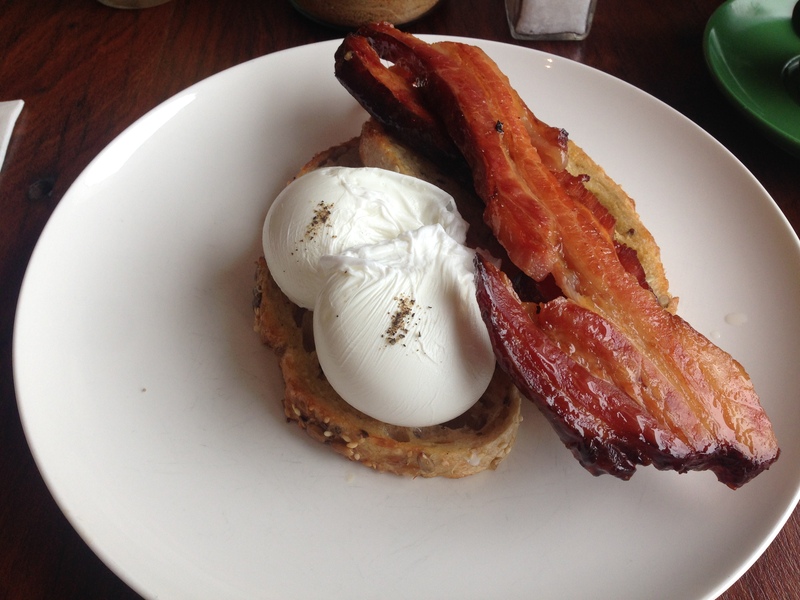 The eggs are perfectly poached and the grainy bread delicious. On top of this the Nicaraguan single origin is excellent and made on a Synesso machine. I had two and for some reason while the first was good, the second was even better. I know Geelong is not the country. It could certainly not be described as quaint. But there is a lot to like about the surroundings, and you can find plenty to like in the immediate vicinity if you care to look before dismissing. Freckleduck is a good reminder of the quality on offer. Seddon is one of the hot suburbs in the West at the moment. It is not huge by area, but what it is offering in terms of cafes and restaurants could be considered punching above its weight. Today we are here are checking out Common Galaxia; one cafe that I’ve heard plenty about. There are some places that seem to hit your subconscious more than others, and this is certainly one, with photos of its milkshakes all over the place. We’re not here for milkshakes today, but having seen many of the creations while eating lunch there is no doubt our next visit is around the corner. Catherine, still in a breakfast mode, orders eggs benedict with Grandma ham and hollandaise, and I go for the wagyu burger. So far it has been great. We enquired about booking for lunch and found that there is the usual no bookings policy, but the helpful staff still put us down for a table at 12.30pm or thereabouts. Add to this the coffee is great and Catherine’s orange, apple, and strawberry juice is delicious. The wagyu burger comes out and looks ridiculously good with Swiss cheese oozing over the patty along with plenty of wholegrain mustard for good measure. 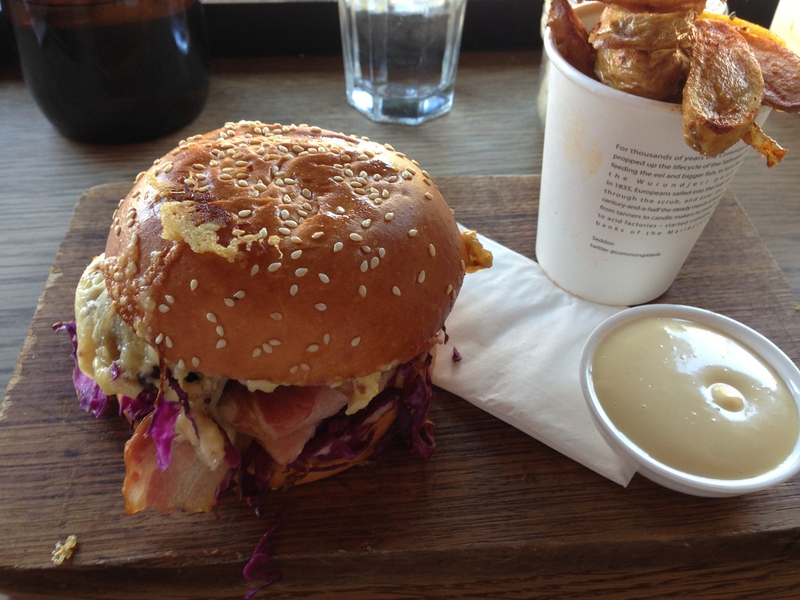 There’s lots of bacon and caramelised onion too, not to mention pickled red cabbage at the bottom. All of this inside a beautiful brioche bun could be perfect, however the small let down is the overcooked wagyu patty, which after all is the star ingredient. There is no such issue with the gorgeous crispy kipfler potatoes in jimmy salt! 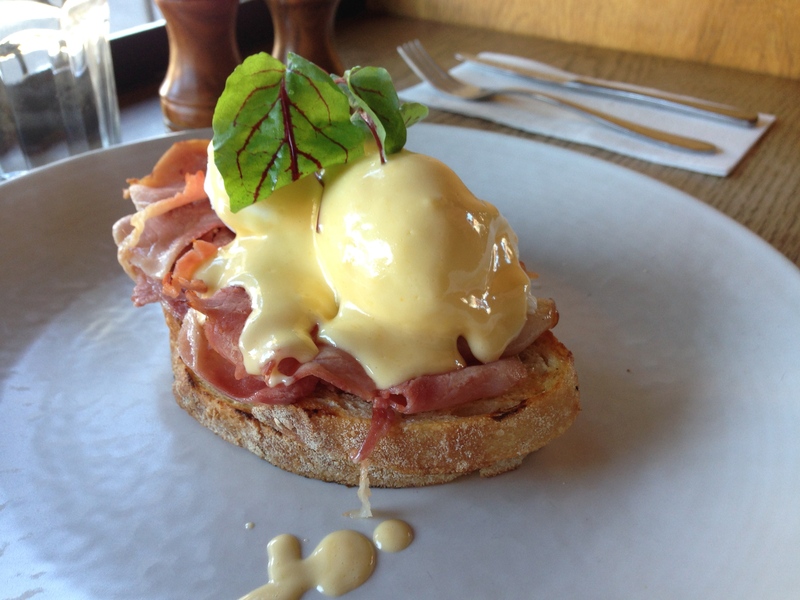 The eggs benedict is absolutely perfect though, with stunning poached eggs, delicious ham, and well executed hollandaise. This is an old favourite of Catherine’s and she is in heaven. Our first of hopefully many trips to Common Galaxia is definitely worth the drive West and shows the abundance of great places that are really not that far away. This is one part of Melbourne that is not particularly scenic, next to both train and tram tracks, and a double lane busy road. The scene is not important though when assessing a new place to try for breakfast. Mixed Business is next to the Terminus Hotel, another place that we are yet to try, but it is on the very long list. We have a short wait outside, which on many other days would be extremely pleasant, but today it feels like winter has come. Three groups waiting are asked whether they would like to take occupation in the courtyard and the resounding decision is no, no and no! A few minutes later and we have a great position overlooking the baristas on the counter. 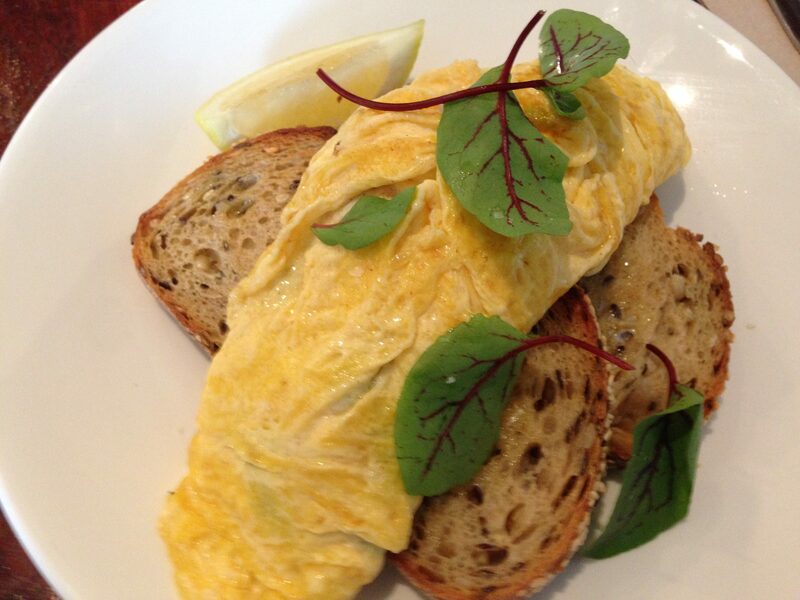 My eye is immediately taken by a smashed pea and ricotta omelette with fresh mint and smoked cherry tomato. It comes out looking great, with toast that is actually buttered, which unfortunately isn’t a rule anymore. The omelette itself is well executed, nicely folded with the smashed pea, ricotta and smoked cherry tomato all neatly hidden, but exhibiting enough flavour that each bite has that full spectrum of those tastes. 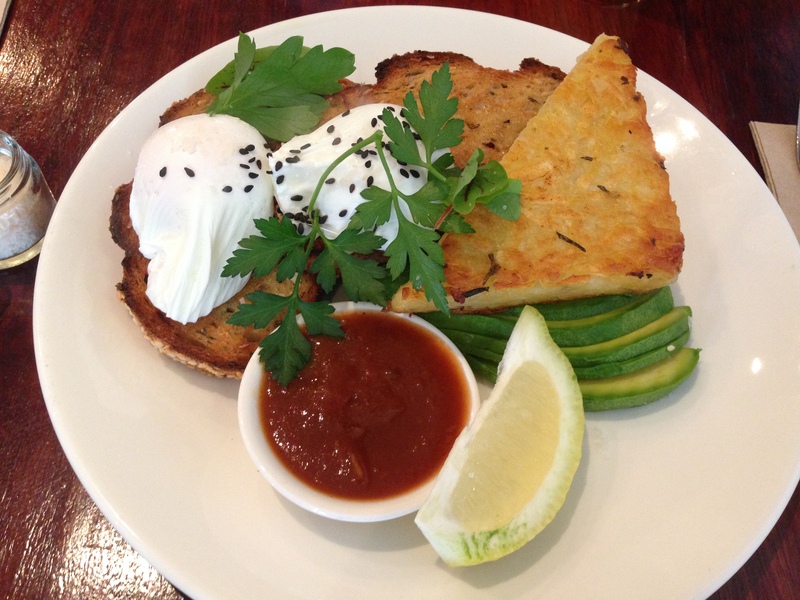 Catherine chooses the potato and rosemary rosti with poached eggs, avocado and house relish. The poached eggs are perfectly cooked, oozing over the toast and providing some extra sauce in addition to the relish to go over the potato rosti. The rosti itself is crisp but has plenty of soft potato in between. It is a nice simple combination. The Seven Seeds blend here is so well made that I try three long blacks. I love the fact they are served just-extracted, without filling the cup up to the brim with hot water. While it would be great for a single origin to be offered, the blend makes for a terrific coffee. Catherine had semi-sweet freshly squeezed orange juice, and a spearmint tea with fresh mint which was a good way to finish. We had no issues with service being right on the counter, meaning every time we needed anything it was only a metre away. Inside, besides being sheltered from the weather, the café is minimalist with white walls, high ceilings, and a mix of wooden table settings. The courtyard is particularly appealing for warmer days, with plenty of nicely shaded tables, and some would be in the open sun. Mixed Business is the right combination of excellent food and coffee in a casual and comfortable setting. It is definitely one for the return list, especially to combine with a trip to the Terminus for a beer after breakfast or lunch. When you start dinner early there can be an almost eerie feeling of arriving in an empty restaurant, down a side street, in an empty area. With a tree adorned with fairy lights out the front, and bright white walls on the exterior, it is a good looking place. The friendly greeting and offer to close the windows as the night grew chilly helped the unease of being the only diners. It is a new thing for Meatworksco to open at night and before long there were three or four other tables seated adding some atmosphere to the nice, clean fitout with curious Roman pillars on part of one wall. It’s a large restaurant, so it will need to build its clientele quickly. American style barbeque has grown in popularity with such gusto that now a new addition to this genre is almost expected on a regular basis. Here there is a focus on platters to share between two and we choose the red meat offering, along with heaps of sides. Unusually, for a restaurant cooking meats for 16 and 20 hours, there are large seafood options including a dedicated platter. I say unusually because this restaurant is called Meatworksco. This is where the formula here is unusual with a quasi-counter ordering system. I know counter ordering well, and I know table service well, but once this restaurant gets busy, I’m not sure whether the quasi system is going to work. We had our table set when we arrived, ordered drinks from a waitperson (who brought them to us), and had menus on the table, but equally we needed to order our food (and any more drinks) from the counter, and the waitperson came and grabbed our menus once we had ordered. To me, an organisational freak, this just seems unworkable. Add to this that we didn’t pay until the end so it is almost like table service, without being able to order or pay at the table. 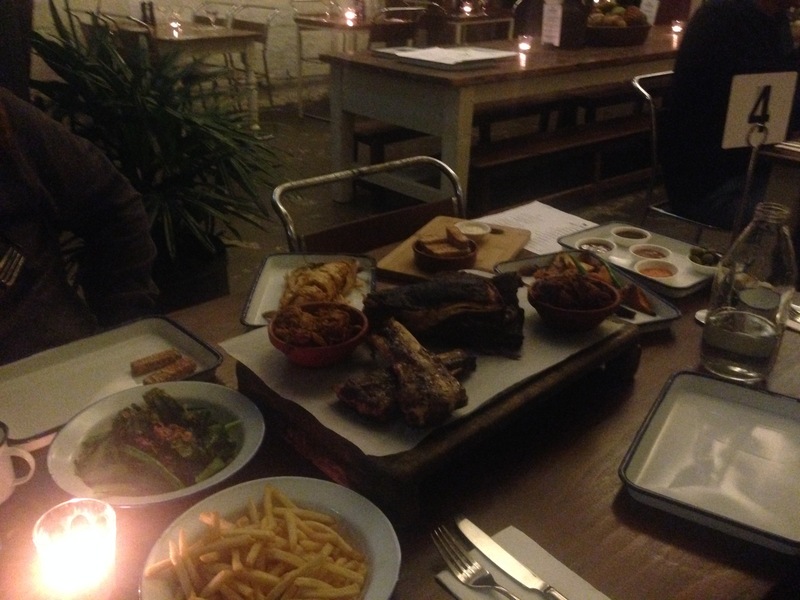 The meat platter is huge, and although it is for two, it is shared between the three of us. It has pulled pork and brisket, beef ribs, lamb ribs and short ribs. 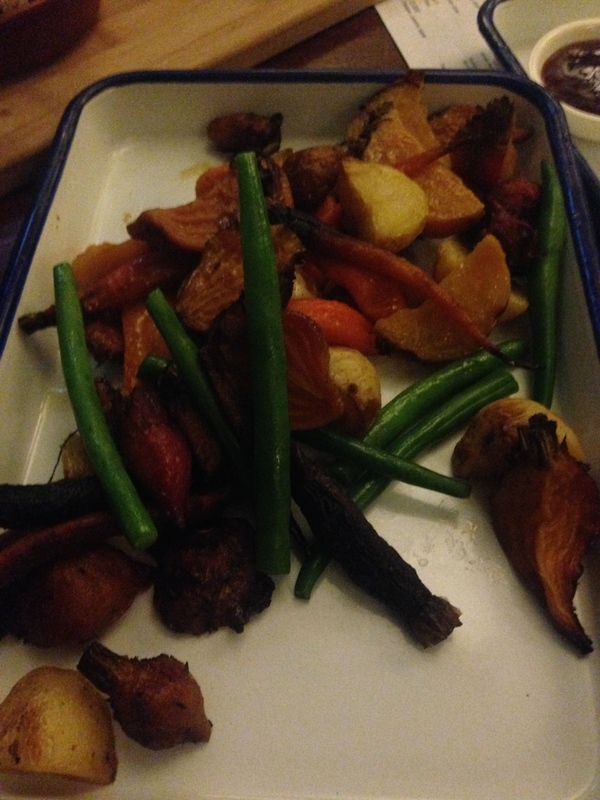 Everything on the platter has been slow cooked to excellent effect. The difficult aspect is more in comparing the taste of each meat on the platter, with those on other restaurant platters. What I particularly like on this platter, which is not comparatively cheap, is the size of the ribs, which have obviously been cooked for a long time, with meat easily coming away clean from the bone. There is a fair bit of fat through the “Tomahawk beef rib” but that adds to the flavour and while it is an effort to get to the meat (steak knives are needed) it is great when you do. My favourite part of the platter however is a tie between the 20 hour smoked pulled brisket (deep in flavour) and the beautifully glazed pork ribs in smokey plum. The 16 hour smoked hand torn pork shoulder was a bit too gamey for my taste in pulled pork and needed the several sauces offered to soften it a bit. 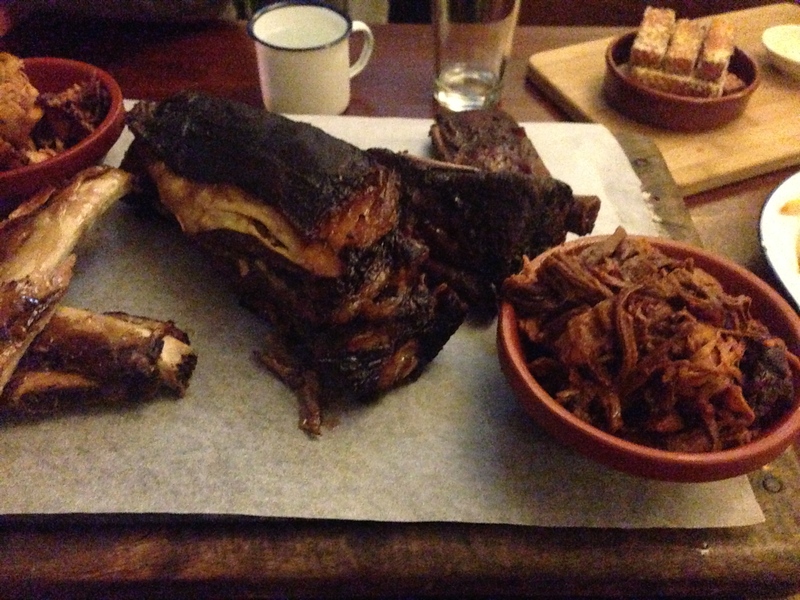 The sticky lamb ribs were outshone by everything else on the platter, but were completely fine at the same time. We really gave the sides a good shake. Again there were good through to average, with the roasted heirloom vegetables terrific, but the polenta chips uninspiring. The shoestring fries were fine, but a little soggy, the roasted corn with parmesan and chipotle mayo was overcooked, but the flavour of the sweet corn was still good. 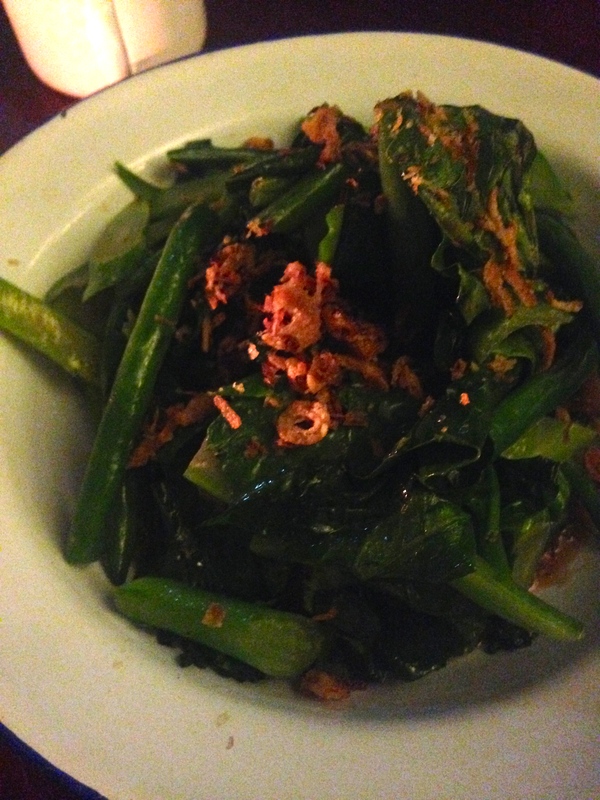 Lastly the wok tossed Asian greens with hoisin was an interesting offering, and actually worked well to break up the meat eating. There is good food to be enjoyed here at reasonable prices, in a nice environment. It could improve the tempo of the meal by simply making the leap to full table service, but everyone on the floor is friendly and helpful all the same.